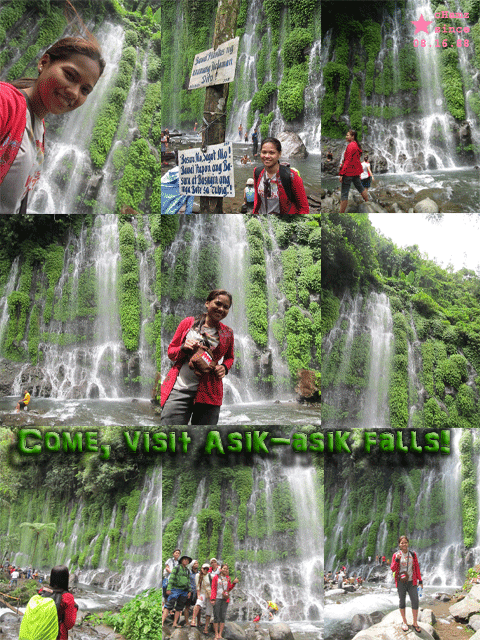 Asik-asik falls. It has been featured in Rated K of ABS-CBN before and when I saw the video, I told myself, "I will visit this place soon". It is situated in Upper Dado, Alamada, North Cotabato, Philippines. Asik-asik falls has gained its popularity because of its astonishing view of curtain-like falls. According to people of Alamada, the big tree that was covering the falls was affected by the typhoon. This is the reason why the falls was accidentally discovered by a teacher. The teacher was hiking and took a video of the falls. That video was shared and people of Alamada were astounded and asked where was the video taken. By then, Asik-asik falls was considered to be a tourist attraction of their barangay. Asik-asik falls is a newly discovered natural wonder in Mindanao, Philippines. There is no river or any streams of water above the hill and the water is amazingly springing from the rocks being covered by grasses that resembling green large curtains. The fresh water that falls from it down to the river is cold which entices visitors to swim from it. You can go swimming and take a bath there but you are not allowed to use soap or shampoo to preserve the cleanliness and natural water of Asik-asik. Moreover, they have said that the waters of the fall can be drink and said to have healing powers. So, I . . .
Hi, nice place. May I know, how we can go there? I mean,if there are agency that can bring us to go there. I am from Malaysia. Thank you.